Rebbetzin Chana Schneerson was born 28 Teves 5640 (1880) in Nikolaeiv, Russia. Her father was the distinguished and pious scholar, Rabbi Shlomo Halevy Yanovsky, Rabbi of Nikolaeiv. Her mother was the righteous Rebbetzin Rachael, daughter of Rabbi Yitzchak Pushnitz, The Rabbi of Dobrinka. A s a young girl, both her father and her great-grandfather, Rabbi Avraham David Lout, educated Rebbetzin Chana. Her father was known throughout the Jewish world for five scholarly books he authored. In 5660 (1900), Rebbetzin Chana married the renowned and pious scholar and brilliant kabbalist, Rabbi Levi Yitzchak Schneerson, great-grandson of the Tzemach Tzedek, The Third Lubavitcher Rebbe. Rabbi Levi Yitzchak was appointed Rav of Yekatrinoslav (now Dneproptrovsk), and for all practical purposes was the spiritual leader of the entire Jewish population of the Ukraine. Rebbetzin Chana stood at his side, adding to and assisting in his holy work. The congregation in Yekatrinoslav was comprised mainly of non-religious professionals. The Rebbetzin, an intelligent and pleasant person, was not only knowledgeable in Torah, but also spoke Russian. She had a good rapport with the members of the congregation and thus contributed significantly to her husband’s success. She was an elegant woman, always well-dressed and friendly. Rebbetzin Chana gave birth to three sons: Her eldest is Rabbi Menachem Mendel, The Lubavitcher Rebbe. In 5699 (1939), Rabbi Levi Yitzchak was arrested because of his energetic work to preserve religious observance. When he was exiled a year later, Rebbetzin Chana joined him, paying no heed to the difficulties and dangers involved. Rebbetzin Chana was widowed in 5704 (1944) when Rabbi levi Yitzchak passed away prematurely, at the age of 66, from the harsh cruelties of his exile. 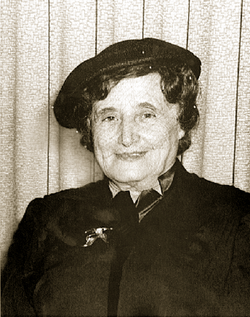 Three years later, Rebbetzin Chana succeeded in emigrating from the Soviet Union. At great danger to herself, she smuggled out her husband’s writings of Kabbalah. These writings were later printed and published by her son, The Rebbe, and are available to all of us. Later that year, she arrived in Paris where she was reunited with her eldest son, whom she had not seen in 20 years. The two traveled to New York, where The Rebbetzin lived the last 17 years of her life warmed by the light of her son who, in 5711 (1951), became the seventh Lubavitcher Rebbe. Rebbetzin Chana’s gentle, unassuming demeanor and thread of majestic grace intertwined in her every word and movement deeply impressed everyone who met her. Bais Chana of California Women's Yeshiva is named after Rebbetzin Chana Schneerson, OBM.